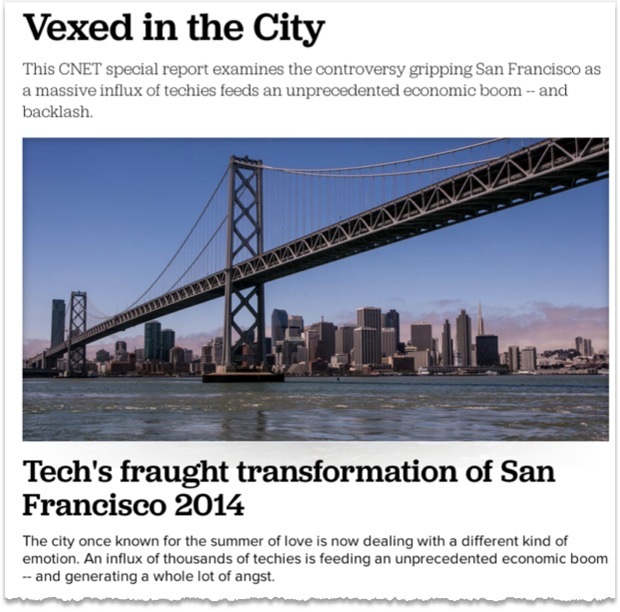 CNET's reporters have published a series of articles under the title "Vexed in the City" examining the pressures on housing and community caused by the expansion of San Francisco's population of tech workers. What's the role or responsibility of the tech industry? The report does a good job in summarizing many of the issues that have been divisive in San Francisco and to an outside reader it will bring them up to date. But apart from Cooper's Benioff interview there is very little new ground revealed and there's a lost opportunity to move this important story forwards. - I'd love to know why the tech companies insist on shipping their tech workers daily to a central holding facility on their colossal creepy looking black windowed buses when there are excellent telecommuting technologies available. Google has chat, hangouts, drive, docs, etc, all are perfect for telecommuting and enabling work group collaboration. Google officials have said that remote teams are as productive as those at the Googleplex. So why do they insist on bussing? - The pressure on housing in San Francisco and in Silicon Valley that comes from the all-cash home buyers from China and who are leaving the houses empty. They see it as a good investment and a hedge against a crash in China's real-estate bubble. This is becoming a very large problem and is pushing up rents and housing prices because the buyers always pay significantly over the asking price. Thousands of empty houses in San Francisco and the Bay Area amid other pressures on housing is a potential political time-bomb. - How are the free lunches and services affecting local businesses? As Google preps for a massive expansion in San Francisco how will that affect local businesses? It's a big problem in Silicon Valley where the Googleplex has harmed many local restaurants and services. How will San Francisco's small businesses and restaurants survive in competing with Google and the many other tech companies that offer similar perks? - What are the benefits of having a large tech community in the city when it suffers from the same issues that aflict all other cities? Why are the public schools so bad when there are so many tech companies claiming to change the world and change education, too? Why doesn't charity begin at home? 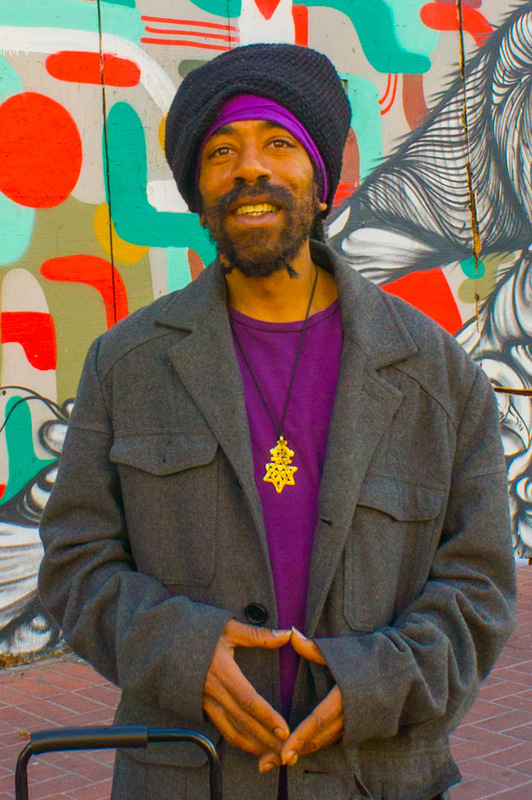 - How is Twitter gentrifying mid-Market? Has it fulfilled its agreements with the city in return for massive tax relief? What are the responsibilites of the other tech companies that have received similar tax breaks? How is Twitter's free food and services affecting local businesses? CNET has made a good start but there's more to be written on this fascinating story of tech and community. I hope the editorial team follows up and stays on top of this story.